14th Birthday Party guest book. He loves when people love me. Happy birthday Lila..Stay healthy . Happy birthday sweetheart you are so cute Hercules say Hi I lives in Ca I’m going on 7 Nov 28. Happy Birthday Sweetie. My Muffin will celebrate her 14th birthday in December. Wishing you many more happy tail-wagging years! Happy 14th Birthday Lila. You look absolutely wonderful. Hope you have many many many more. Hugs & Kisses…..Grace, Bea-Gee and Muffit. Jake and Sophie want to wish you a happy happy happy 14th birthday!!! Happy birthday Lila from Timmie! We are so glad you got your mom and dad hooked on breeding Bichons as they took such good care of me before I went to my forever home and I am as happy as can be! Happy 14th birthday! Timmie and my mom, Janet. Happy birthday! May all your birthday wishes come true. toys and a new dress. I got my mommy and daddy addicted to loving Bichons 14 years ago. After I came along they had to have more Bichons. 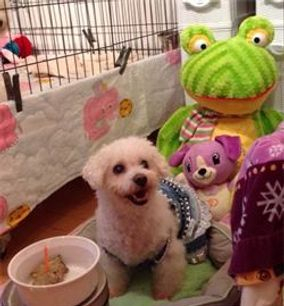 My mommy and daddy became a Bichon breeder. 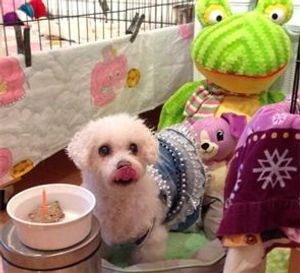 They love having baby Bichons to love and take care for. 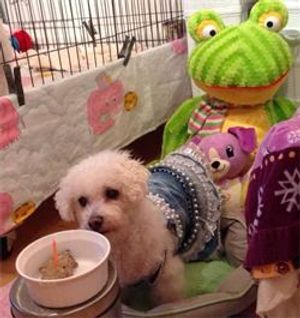 Bichon Lovers babies and it all started with me. When I was 12 years old I wasn’t feeling very well. My mommy said I had arthritis and had too many vaccines. Mommy searched for stuff that would help me and this is what she found that worked really well. www.bichonlovers.com/Daily-menue.html and an all natural immune support. I race around the house. My mommy says she is going to keep my health so good.